The Skinny: Probably Jet Li's most internationally beloved motion picture. Great fighting and Li's requisite presence make the film a winner. by Kozo: Gordon Chan's popular remake of Bruce Lee's classic Fist of Fury casts Jet Li in the shadow of Bruce. While studying in Japan, Chen Zhen (Li) receives news that his old master has kicked the bucket. Chen returns to China and learns that his master died fighting a Japanese soldier (First Strike's Lau Hok-Yin). Chen can't believe that his master would lose to such a lowly fighter, so he orders an autopsy and discovers that his master was poisoned. Figuring that the Japanese are trying to exert their dastardly influence, Chen plots vengeance by beating up hordes of Japanese martial artists without breaking a sweat. As a remake, Fist of Legend eschews the darker aspects of Bruce Lee's Fist of Fury and goes for something more uplifting and family friendly. Though the film is violent to an extreme, there is a significant lack of blood and Chen's struggle is entirely noble and without greater consequence. As an added bonus, Chen receives a Japanese love interest (played by Nakayma Shinobu of the 1990s Gamera series), leading to an obligatory discussion of the intolerance that both Japanese and Chinese fostered during those tough times. Like that matters. Any and all drama the film purports to explore is neatly shoved aside for fighting, fighting and more fighting. Jet Li finds new fast-motion and slow-motion ways to severly injure many individuals, and he does so rather convincingly. 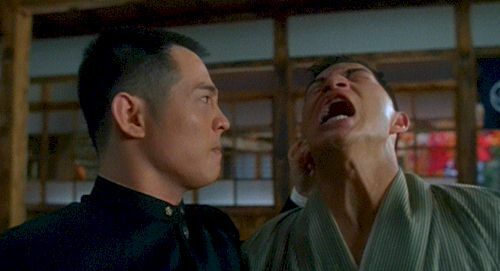 Of special note is the extended duel between Chen Zhen and his Japanese teacher (played here by Yasuaki Kurata), which employs a variety of fighting styles - one of which involves the two wearing blindfolds. Action director Yuen Woo-Ping earns his paycheck and then some, and the story and direction are solid and intelligent. If one could fault the film for anything, it would be its distinct lack of any real passion or emotion. The seeds of good drama are there, but Gordon Chan handles everything in a remarkably workman-like fashion. The result is entertaining and sometimes exciting, but any and all drama outside of the fighting seems necessitated by script and not really character. Notes:  One of the original Disney acquisitions of evil. Fist of Legend's original US release is better than its bretheren because its fights are intact and it retains the same title. It isn't called Jet Li's Revenger or Jet Li's Fighting Fist of Fury or Jet Li Attacks the Japanese. It's called Fist of Legend. Unfortunately, it's still dubbed, cut and rescored. Sigh.  Years later, Dragon Dynasty corrected Dimension's original error with an intact North American release on DVD and Blu-ray.